As Andy says, pale ale is the ultimate calibration beer, and Deschutes does one that typifies the style. Medium in everything- color, malt, body, mouthfeel, hoppiness- and in no way is medium equivalent to mediocre. Everything's in balance. On sight, this is pretty much indistinguishable from the regular Mirror Pond. The nose has a delicate but very distinct hop character. The flavor has the same features- all of the same qualities of the usual Mirror Pond, with a bit more of the citrus and grassiness of the hops coming through. What they've done here is deepen the hop character of the usual Mirror Pond without knocking anything out of balance. 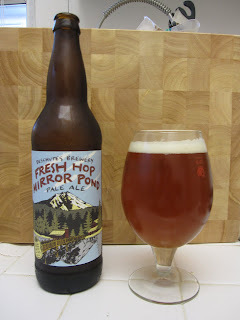 It's almost like the fresh hops allowed the brewers to slightly adjust the focus knob and sharpen up the hop influence. This may demonstrate perhaps the greatest benefit of the fresh hop approach- you can help the hops step forward without increasing the bitterness and disturbing anything that makes a beer great in the first place. I really hope these guys do a fresh hop version of The Abyss, it could be the ultimate beer flavor overload.